Fire Damage in Las Vegas, NV - GraEagle Construction, LLC. Fires can happen unexpectedly and suddenly, leaving your home in ruins and your health at risk. However, with the help of GraEagle Construction, LLC, you can have your home back like new. We provide comprehensive restoration services for fire damage in Las Vegas, NV. After a fire, don’t risk your health. Contact us at GraEagle Construction, LLC, for quick fire damage restoration. Along the way, we’re happy to answer your questions and alleviate your concerns. As soon as your house is ready, we’ll let you know and ensure everything is to your satisfaction. Additionally, we are happy to help with the insurance claim paperwork. We’ll work with both your insurance company and you to ensure that you get all the necessary repairs for the best prices possible. After a fire has devastated your home, you need an advocate during this emotional and stressful time. 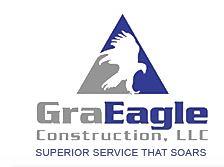 GraEagle Construction, LLC, can help. Call us 24/7 at 702-248-0170 to discuss your fire damage needs with us. Whether you have questions or need help now, we’re happy to be there for you.